It’s rare to have a drummer be the focal point of a band. It seems to only happen in the prog or jazz worlds. Mike Portnoy, formerly of Dream Theater fame, is one of those drummers that prog nerds just lose their minds over. He’s the modern age version of Neil Peart. I can say this because I count myself as one of those worshipers at the altar of all things Portnoy. He is one of those drummers that has a distinct drumming “voice”, i.e. you know him when you hear him play. However, since Portnoy and his Dream Theater mates went their different ways back in 2010, it seems as though he has been on a very scattered journey to find his musical voice. The sad thing is that the post-break up Portnoy and Dream Theater catalogs have both meandered between “meh” and downright terrible. Neither entity seems to have anything in the way of direction without each other. Dream Theater has sputtered into a self-indulgent shell of its former glory minus Portnoy. Portnoy minus the anchoring nature of the Dream Theater concept seems to be an overactive ADD suffering child who has been off his medication for some time. He’s gone from guest spots with Avenged Sevenfold and Twisted Sister, helmed all of Neal Morse’s solo albums, formed a proggy pop group Flying Colors, tried his hand at macho bro-rock in Adrenaline Mob and dabbled in flavorless blues rock with The Winery Dogs. Sure, there have been some decent albums come out of his collaboration with former Spock’s Beard frontman/multi-instrumentalist Neal Morse, but overall Portnoy hasn’t approached anything close to the albums produced during the seminal days of Dream Theater. So, this brings us to Portnoy’s latest endeavor, Sons of Apollo. In an attempt to create a prog metal powerhouse to presumably be on par with Portnoy’s former band, Portnoy has partnered with ex-Dream Theater keyboardist, Derek Sherinian, bassist Billy Sheehan (ex-David Lee Roth, ex-Talas, Mr. Big, and current Portnoy collaborator in The Winery Dogs), guitarist Ron “Bumblefoot” Thal (ex-Guns and Roses fill-in for Slash), and vocalist Jeff Scott Soto (veteran metal and rock journeyman). So, how does the finished product stack up? It’s OK. I really wish I could endorse it higher than that, but it kind of suffers from the same malady as a lot of the Portnoy projects. Portnoy’s drumming is on point. This is some of the more inspired drumming the dude has put together since he left Dream Theater. He’s definitely playing like he has something the prove. Sherinian is also a force on the keys. I was a big fan of the couple of albums he did with Dream Theater and of the keyboard sound that he brough to that band. Sheehan and Thal are both very capable musicians, but this is just Portnoy and Sherinian’s show. The guitars and bass just end up being more complimentary than anything else on this album. Soto’s vocals are a definite bright spot on the album. I hadn’t really heard much out of him since he sang on some of Yngwie Malmsteen’s albums in the 1980s. Biggest complaint are the songs themselves. There are some catchy things throughout, but the entire album just lacks a cohesive narrative or any sense of an identity. It’s like the individual parts are greater than the collective whole. That is a flaw that will always act as a barrier that keeps a band becoming something great. I don’t really think the players were given enough time for this project to fully gel. 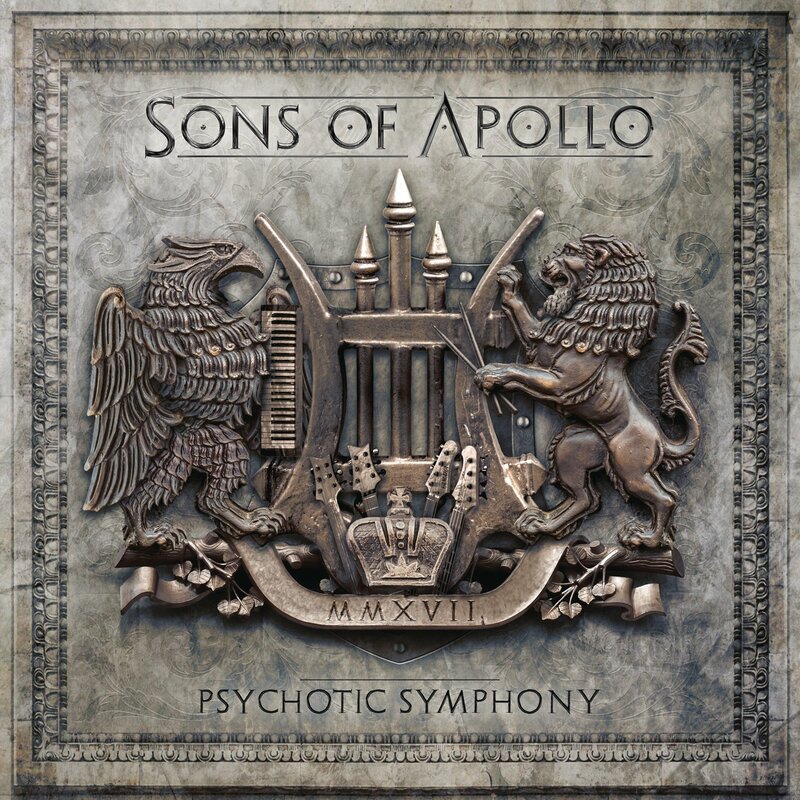 There are hints of Dream Theater, Deep Purple, Dio and the like running throughout the songs, but I never really get the sense of what the Sons of Apollo are. This is one of the flaws that has run through all of Portnoy’s post-Dream Theater projects. They seem to be thrown together so haphazardly and so quickly that none really ever develop an identity. Dream Theater had that. You knew them when you heard them. I understand Portnoy’s need to distance himself from that past legacy and I admire that he hasn’t stood in one place since the break, but it would be nice to have him take a breather. Step back and focus on one of these projects and let it fully coalesce into something special. Sons of Apollo might be it. We are just going to have to see what they do in the future. I’m hoping future release get left in the oven a little longer to see if something truly badass comes out.